Hey there, my fellow light work’in sister!!! I am so incredibly happy you are here!!! I can feel it…. why you are here, That deep desire to serve the world! I know this feeling hard, babe! 6 years ago, my spiritual journey unfolded and It wasn’t long, until I stepped into my own magic and began to share it with everyone I knew! My love and excitement of this amazing spiritual journey, led me from feeling so lost, to found. It was like my heart bursted right into a world that I always knew was made for! I still feel a bit breathless, that this path is exactly where my heart belongs! I am sure you feel the same way! So excited… So free… So joyful and filled with purpose! Oh, it feels so good, doesn’t it? Do you dream of stepping into your own spiritual career? Leaving the “regular” day job behind and working your magic in the world? Well, babe! You are in the right place! I have supported many women, to take their beautiful gifts from a hobby to creating an incredible career!!! Yes, you can have this!!! You can step in and step up as the healer you are, in more ways than one! It is true! This isn’t a fairy tale…. Okay, maybe it is, but it is a real life fairy tale!!! You don’t have to settle for jobs, that drain you and make you feel small….. You were created, to honor exactly what is in your heart, babe! You were made for this!!! It is true! If you feel the call, it was written in your soul before you were even born! You just have to choose it! Yep! It is that easy! Once you choose it, the path begins to unfold, so magically!!! The universe responds to you, girl! You get to co- create the world you want to experience and yes, that is a magical career built to serve and make the money, that will support all of your other dreams too!!! Yes! I said, Money, Honey!!! No part, of your path included a life sentence of suffering and scarcity…. I know this may ruffle a few feathers, but it is true! You were never given gifts, with the purpose that you would have to experience lack, while others thrive! NOPE! Not even close! You can have whatever you want… There is no judgement from source about you making money! and let’s just be really real for a second… If you are here, you deeply desire to help others, so why would you second guess your own intentions. The money you make only multiples for others!!! You don’t want to make money, because you are greedy, you want to make money, so you can help more people! Am I right!? So, let’s just breathe for a second and allow that to sink in… Yes, you can make money, create a dream life and serve the world, by sharing your gifts! I remember when I first started supporting others, It felt so amazing, but something was missing…. I couldn’t contribute any money to our household. I felt so guilty! My guilt about receiving money was so bad, that I worked for free for a whole year. I knew that I couldn’t keep going like that. I was spending my days helping people meanwhile, my family was struggling. Something had to change, that is when I sought out for mentoring and it truly opened my eyes and my heart! I couldn’t believe how deep my guilt ran, when it came to helping people in the world. I always believed that I need to work a “real” job that was worthy of money, but I couldn’t do a job that was soul driven and make money…. I believed it was wrong! My heart hurt so bad! It took me a few years to heal and understand this further. I had believed, old beliefs from people that misused power. I learned that I didn’t need to believe that anymore! When, I shifted, everything shifted! I can sit here today, with an overflowing heart to tell you, when I finally LISTENED to my soul and followed my desire for what I want to do in the world, my whole world became a real life dream! I now create my own rules about MY life! I am creative, I am magical and I make impact in the world by stepping into it all! Yes, to you! Yes, to your gifts! Yes, to serving the world? Yes, to making money? Okay, Okay! Let’s go then!!! No MORE waiting! WORK YOUR MAGIC, is here to serve you, girl!!! Let’s connect with the energy of your business!!! 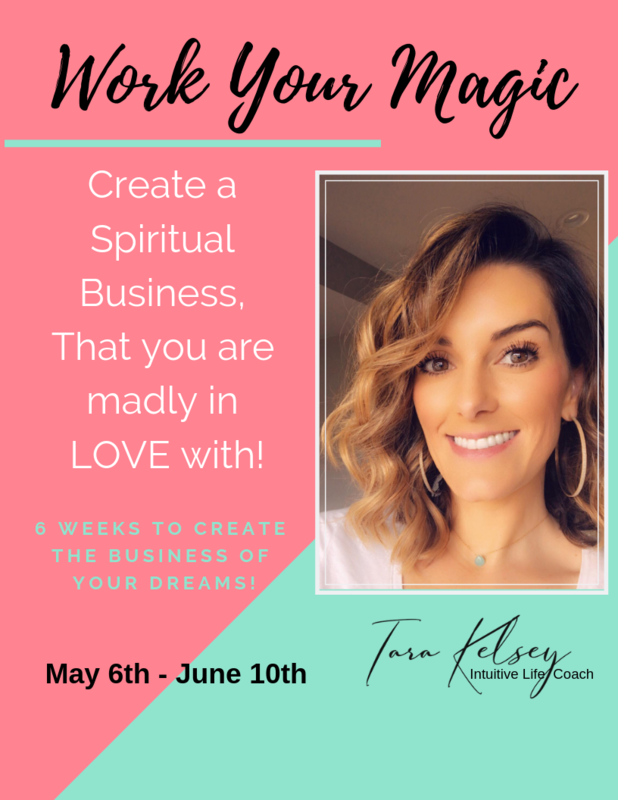 6 WEEKS TO CREATE A BUSINESS YOU ARE MADLY IN LOVE WITH!!! Here is what this beautiful program covers! If you book by 04/15/19, You will receive a 20 minute Zoom video call with me! It will be your time to ask anything about your business!!! Yahooo!!! 3 amazing payment options are available for you!!! By signing up for classes, services or coaching packages you are assuming full liability and risk. www.tarakelsey.com is not responsible with what you decide to do with any knowledge you receive from classes, services or coaching packages. www.tarakelsey.com shares personal experience and knowledge with the utmost honesty and integrity, please take away what you feel is right for you! As with anything, please use your own discernment. www.tarakelsey.com is used for guidance and educational purposes only. www.tarakelsey.com cannot guarantee results of any kind, as each person is unique and different.